A few weeks back I was listening in on a conversation that an EHR implementation team was having. They wanted to figure out what tasks or parts of the EHR a nurse was using throughout the day that were causing hangups for her. I promptly stepped in. Time Study! A time study is a log of all the tasks performed in a period and a detailed record of how much time each of those items took to complete. In the past, these studies have been mind-numbing and labor intensive as the performer ran around with somebody with a stopwatch and a pad of paper to meticulously document every second of the observation period. However, with the advent of the smart phone, this task has turned into something that is merely mind-numbing to perform. It is not a workflow study. Do not expect to glean insights into improving processes. It is not a study of the entire office at once. Focus on one person at a time. Unless you are an octopus, do not try and keep track of multiple people simultaneously. It is not a tool that will generally yield useful results by itself. Decide on an adequate length of the time study and when it should be performed. A time study should capture a “typical” time period for whomever you are observing. However, given that a typical day doesn’t exist in many clinics, it may be beneficial to do a handful of studies over a period of time, randomly sampling different parts of a schedule. Get a time study app for you phone. 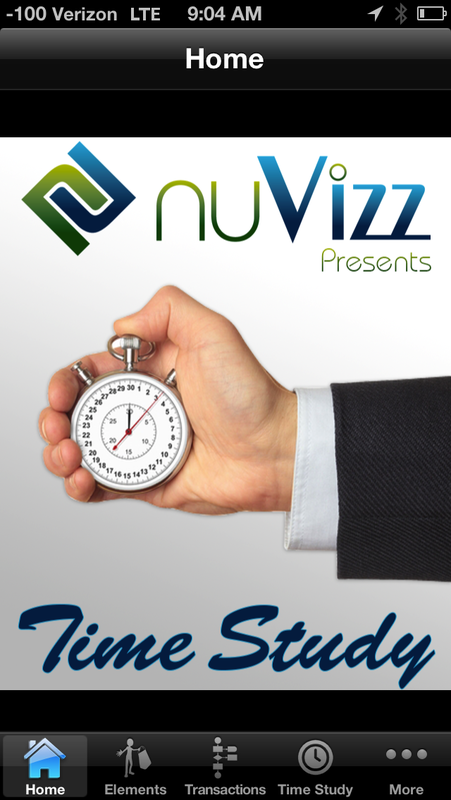 I used one on my iPhone aptly titled “Time Study” by NuVizz. It was very easy to set up, allowed me to create customized categories, exported the results to an .xcl file, AND it was free. My only critique of this app was that although it allowed you to enter notes during the study, it didn’t place a time stamp on when the notes were entered. Perform the time study. This is the mind-numbing part. Stay vigilant for the hours this is being performed to accurately push the category button when the observed changes tasks. It’s monkey work, but can actually take some serious decision making power during that crucial second you have to decide which category button to push and when. I entertain myself during the period between pushing buttons by pretending I’m a medical student during the patient exams and learn how to be a doctor. 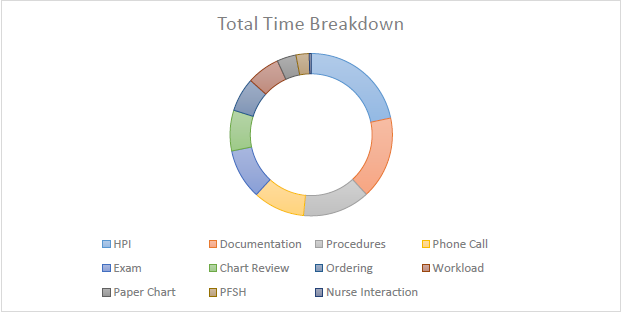 Process the data into some charts and draw up new reports if applicable. Visualizing the time break outs is generally more effective than seeing the raw data. Management and executive types generally like shiny things too. One thing to keep in mind is that a single time study is a snapshot of someone’s daily work. It cannot, by itself, place judgement on whether a particular item is taking up too much time compared to other things. What it does allow you to do though is compare the amount of time being spent on one thing versus another. For instance, you will clearly be able to see the amount of time a provider spends interacting with a patient opposed to interacting with the computer system. It is the goal of good medical practice and good software implementation practice to minimize the time spent interacting with the system and maximize the time spent interacting with the patient so we draw judgement of the data through that lens. As a real life example, I was asked to do a time study of a physician because he was falling behind in his documentation compared to his peers. The time study revealed that he spent the majority of his time interacting with the patients as compared to interacting with the system so it was deduced that software “roadblocks” were most likely not the issue. 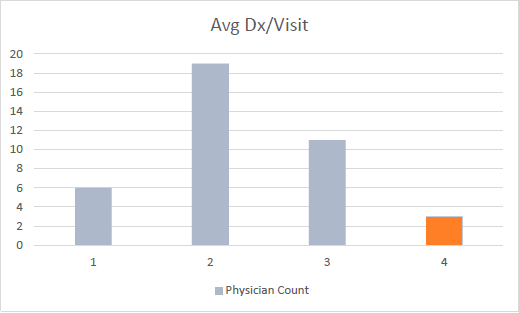 To glean extra insight, I compared the average number of diagnoses he assessed and documented on a patient visit as compared to his peers. It turned out that, on average, he was assessing twice as many issues per patient than his peers in internal medicine. The study proved to bolster the physician’s own confidence in how he used the system, which helped his turnaround time a little, but did not indicate the need to investigate technical solutions. And that is what time studies are all about. They do not provide solutions, they are assessment tools. What a successful time study can indicate is an area that requires further investigation. They are metrics that need to be put into context. At the end of the day though, it is always good to keep in mind that sometimes the result of a time study is simply that everything is at it should be. To establish a baseline and to perform at regular intervals. 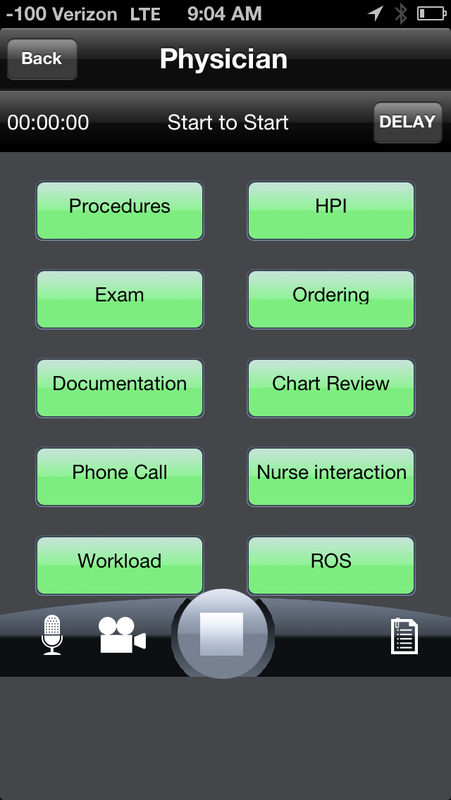 To determine how the implementation of a new workflow or system feature impacted time spent accomplishing a task. A study should be done prior to and post implementation. To identify potential bottlenecks or areas where inefficiencies may lie. The reverse of this is true as well. Sometimes a study can indicate where problems are not.